While I’m sure most farmers don’t think of it this way, there is a definitive uniform most of us wear as we go about our daily tasks. It’s a practical collection of clothing and tools that help us get our jobs done. Here at Innisfree Farm, the uniform is pretty well defined. At its most basic, it consists of a hat, t-shirt, pair of jeans, socks, and a good pair of steel-toed work boots. Added to that is a good multi-tool and a pair of work gloves. During the winter, the ensemble expands to include stocking caps, sweatshirts, long underwear, and winter work gloves. Some farmers replace the work boots with mud boots of one sort or another, but I find the risk of crushing my toes often outweighs the benefits of staying clean and dry. Further, almost any kind of clothing can be worn, as long as it covers most of the body and is tight fitting enough to avoid getting caught in machinery, a problem that is especially present in the winter when we have to wear more clothing. Some accessories that often go with our uniform include a good flashlight, a toolbox filled with our most commonly used tools, and a water jug. Sometimes, a pair of suspenders can be useful to help keep one’s pants up when the work requires constant bending over. Overall, this is a time tested uniform for farming as I have seen it in use. I’ve always heard about how dangerous farming can be, and looking at all the big machines and whirling widgets leads me to believe that’s true. I’ve worked very hard to be as safe as possible, but frankly, sometimes, accidents just happen. An example was last night, wherein the hitch pin for the borrowed tedder I was pulling came out, causing the tongue to dig into the ground and flipping the thing completely over. Amazingly, the only serious damage was that the sheer bolt and bearings on one of the PTO shaft u-joints were completely destroyed, which means replacing the PTO shaft. Otherwise, the thing is still in good working order and is a testament to quality Hesston engineering. Nevertheless, the whole incident reminds me that farming is not for the feint of heart, and it takes true love of what one is doing to overcome all the crap that can tear someone down. I hope everyone remembers that kind of thing the next time they’re standing in a grocery store looking at all the food: in those boxes and cans and displays are a thousand stories just like that one, and I hope that it might prompt a few more people to go see what goes on at the source. 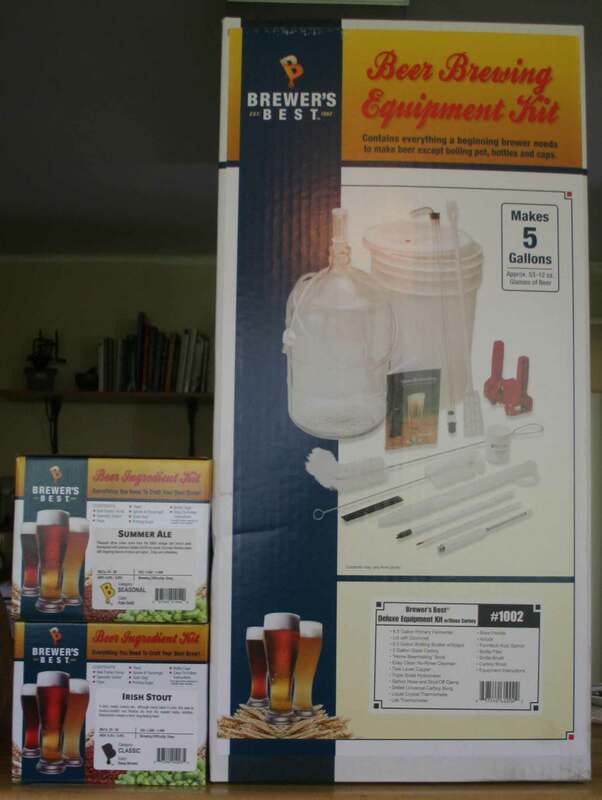 Here’s one for the “checking something off of life’s list” category: today, at long last, I purchased the supplies necessary to form the beginnings of what I hope to be my long endeavor with brewing beer myself. Fortunately for me, and for Dayton, the owner of Belmont Party Supply in East Dayton has made starting this endeavor easy by opening Miami Valley BrewTensils, a fully stocked craft brewing store located at 2617 South Smithville Road in Dayton, right next to the party supply store. I spoke with Jeff Fortney today, and he was very knowledgeable and eager to help me get started brewing. In the mean time, here on Innisfree, my goal is to begin not just brewing my own beer buy growing everything I can to brew it with. If all goes well, by next summer, my “Beer Garden” will be fully established and providing the ingredients necessary to create my own “Innisfree” home brew. Stay tuned for more information as this project progresses. Part of the revolution in food production I am joining is to reject commodity markets in favor if finding ways to raise food that we will sell directly to the people who eat it. The last time I checked, no one eats the GMO field corn and soybeans that dominate our agriculture sector, mostly because they can’t. That field corn and soybeans are only good for industrial food factories that churn out products that have names many people can’t even pronounce and have to be regulated by the FDA. Instead of raising chemicals for the industrial food supply, my goal is to raise food that belongs in your pantry and flour jar. To that end, I’m experimenting with a variety of grain and legume products, including amaranth, barely, flour corn, oats, quinoa, and rye. This year, I’ll be able to harvest what I’ve planted by hand, but at some point I’d like to grow more, and the easiest way to do that is with machinery. Unfortunately, if you’ve looked recently, the entire food production world is geared toward making growing anything but commodity products on a huge scale in the United States almost impossible. The big equipment companies assume you want to farm 2000 acres of the same plant, and the small equipment manufacturers in Asia and Europe can’t find distributors in the US because most implement sellers don’t think anyone is interested in buying. It seems like an impossible situation unless you’re stubborn like me and have a habit of looking at every implement yard you pass. 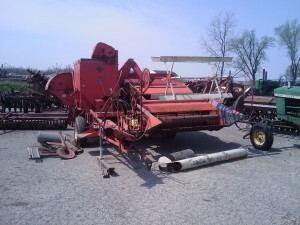 In which case you would see this very good condition Allis-Chalmers All-Crop Harvester 72 sitting in an implement yard. In basic terms, this is a small combine that you pull behind a tractor, and it’s perfect for harvesting small amounts of grain without the headaches of a regular combine, which includes having another engine to maintain and fuel. If I were to buy this thing, I would be able to harvest small stands of any kind of field harvestable product–from alfalfa to zinnias–even just an acre. Perfect for what I need, except that it requires me to spend money–really my mother-in-law who owns the farm’ money–and that’s hard to do when one is trying to be as responsible and frugal as possible. So for the moment, I ponder and I pray. Here’s a chance to take another step toward what I know I want to do. Now I just have to decide if it’s the right time to do it. So, we have about a foot of snow on the ground here at Innisfree, which means it’s time to use the PTO snowblower I hooked up to the tractor Friday to clear the driveways and a path to the barn and hay-yard. That would be, it would be time to use it if it worked. Somehow, the shroud around the fan that propels the snow into the chute got bent, meaning that the fan jammed against the shroud and the whole assembly ground to a halt. How do you fix something like that? With a bigger hammer. Really, using a combination of a come-along and chain to bend the offending part combined with hitting the shroud repeatedly with a sledgehammer NASCAR-style, I managed to bend the shroud back into some semblance of round so that everything could once again turn freely. If you’re thinking about farming yourself, make sure you keep a large selection of hammers, sledgehammers, mallets, and crowbars on-hand. I promise you’ll need them. PS: As an aside, with the amount of hay forking, sledgehammering, and other arm using activities I’ve been doing lately, I should look like a potbellied Popeye by the spring. Farming is a great workout. The farm I am helping run is successful and debt free because my in-laws ran it in a very particular way: they stayed out of debt as much as possible and kept their machines running for a long time instead of constantly replacing them with newer and more expensive models. Their farm is a model for success that I find very attractive and one of the things that has made me so willing to give Innisfree Farm a try to begin with. One of the downsides of that model, however, is that everything has a certain age to it, and that age makes it statistically more prone to breaking. Today, it seemed like everything broke: the older tractor is leaking vital fluids at an alarming rate, the newer tractor had a flat tire, and just to add insult to injury, the ancient deadbolt lock on our back door locked itself, forcing us to break and enter into our own house (ironically, through the same window that was broken to unlock the door the last time that happened). Of course, this all meant spending a few hours in the cold, banging on things with a mallet and swearing a little (not too much, lest to offend), but I’m not really complaining. Why? Because the labor was my own, which cost nothing, the tire just needed reseated because the bead got broken, and another farmer loaned us his tractor until we can get ours fixed. We’re going to make Innisfree Farm work the way it has since the beginning: hard work, rolling with the punches, and finding as many ways as possible to keep it in the black. While other farmers might be sure that we’re going to fail because we’re not using their borrow-and-farm methods, I am sure that the way we’re approaching these things will mean that we’ll still be in business even in the years when bad crops don’t cover their operating loans and a statistical percentage of them go under. Maybe when that happens, I might even be in a position to buy. But, I’m not going to get ahead of myself. Steady as she goes.